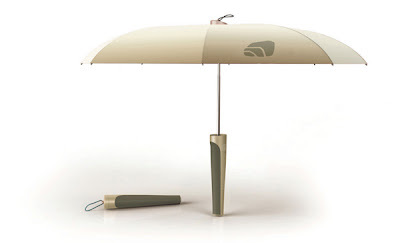 Collection of 'Creative Umbrellas and Cool Umbrella Designs' from all over the globe. 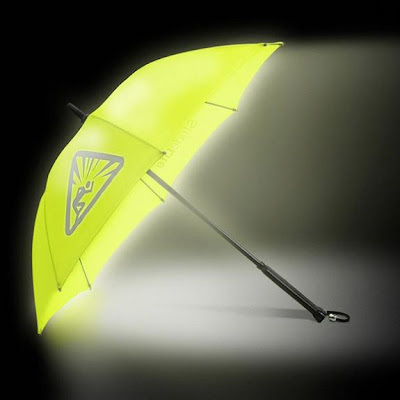 Bright Night Illuminated Umbrella: This lightweight umbrella comes with 3M reflective material on 4 of 8 canopy panels. 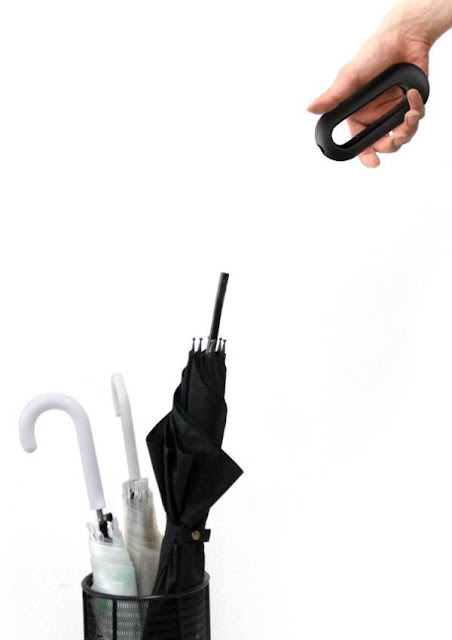 Brolly Umbrella: This umbrella comes with unique holder that lets you text or e-mail while still holding onto your umbrella. 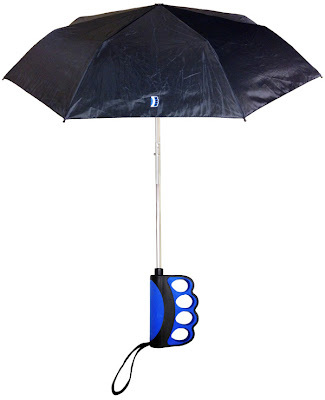 Lizard Umbrella: The umbrella holder comes off and can be taken along while you deposit it in the umbrella stand. Umbrella by Massimo Battaglia: The holder of this umbrella doubles as a sealable housing providing a simple solution for quick, dry, and easy storage. 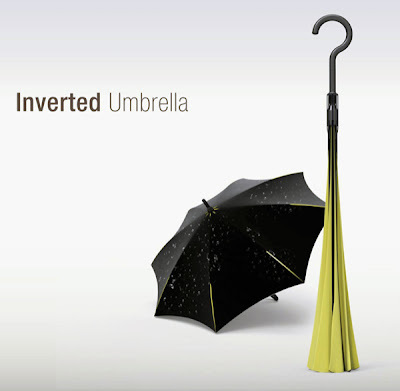 Inverted Umbrella: It functions the same way as a typical umbrella when you open it up; but the clever twist comes when you close it. 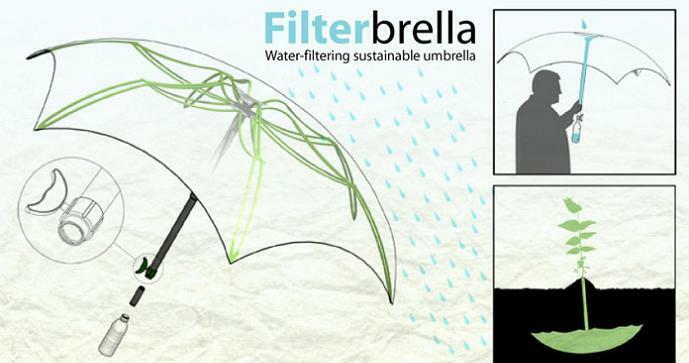 The lining opens outwards when you fold the umbrella resulting in the wet side folding inwards and the dry side outwards, keeping your clothes nice and dry. 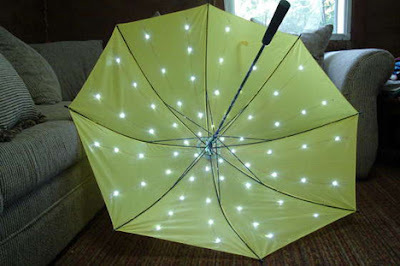 Electric Umbrella: Turn an ordinary umbrella into an electric umbrella that glows with many pinpoints of light. 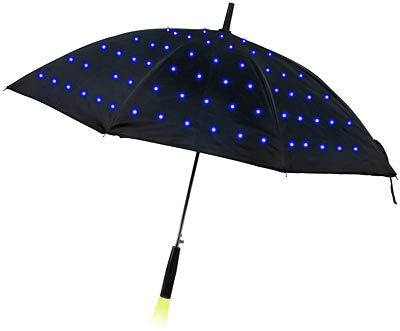 Lumadot Light Umbrella: This cool black umbrella glows with fiber optic light dots covering the canopy. It comes with three modes: off, blinking lights, solid lights. And the light in holder illuminates the ground in front of you. 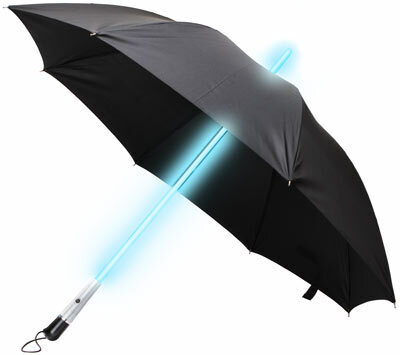 Blade Runner Style Light Umbrella: With the push of a button, the shaft of this cool umbrella lights up illuminating your path. DAP Umbrella: The DAP umbrella features a player and comes with embedded speakers. Color Changing Umbrella: When the umbrella gets drenched, the drops change the color. Filterbrella: The Filterbrella by A Leinonen filters water, resulting in clean drinking water on the go. 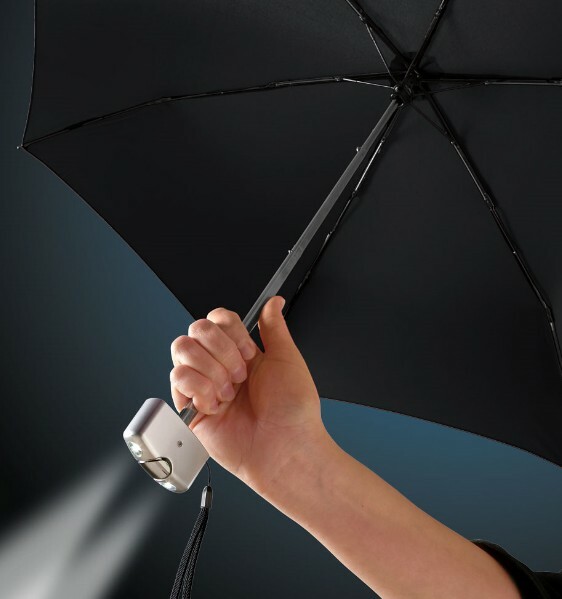 Flashlight Umbrella: The 'Flashlight Umbrella' comes with a super bright, built-in flashlight. 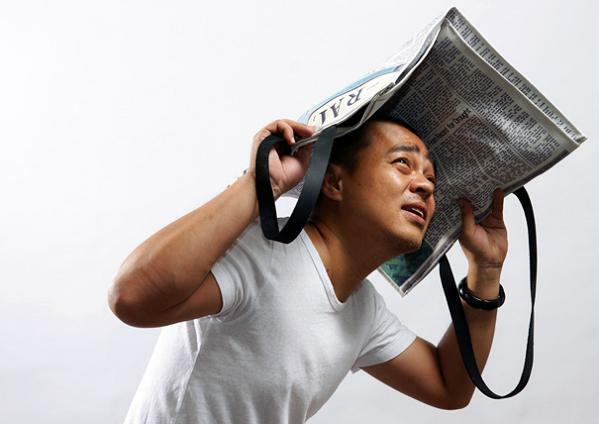 Newspaper Rainbag: It's an all-weather canvas bag that can double as an umbrella. 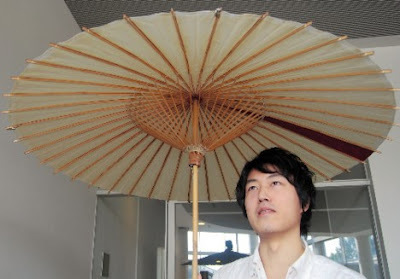 OtoShigure: The OtoShigure is a Japanese umbrella made from bamboo and oiled paper; it's said, "the entire object emits sound when connected to an iPod or other portable audio device". 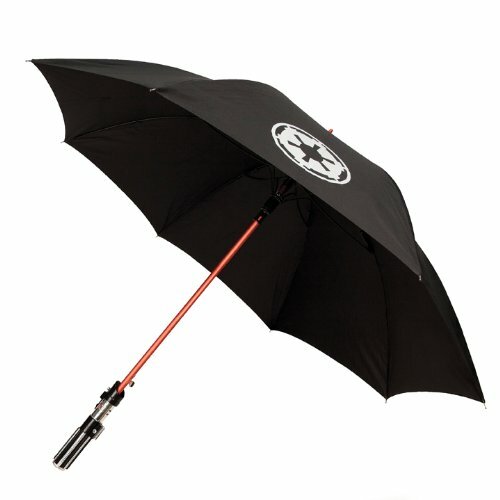 Don't miss to check out "Creative Umbrellas and Cool Umbrella Designs - Part: 1| 2| 3| 4| 5| 6| 7| 8." 15 Creative Headphones and Unusual Earphones - Part 4. 10 Creative Seeds and Sprouts Inspired Designs and Products. 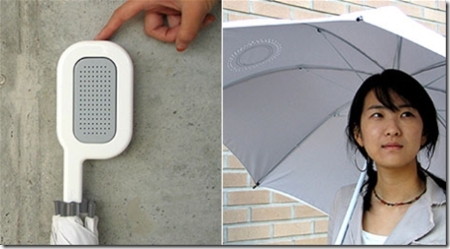 15 Creative Projectors and Unusual Projector Related Designs and Concepts - Part 2.